The new Casio camera features a 6 Megapixel CCD housed in a compact and refined stainless steel body (97.5 (w) X 67.5 (h) X 45.1 (d)  26.1mm at thinnest point). 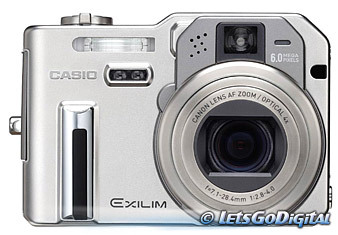 The Casio is able to record photos up to a resolution of 2816x2112 pixels. Clearer and sharper images have been made possible by maintaining the edge of objects while reducing noise. Images can also be recorded directly from the CCD to TIFF format to avoid any degradation of picture quality. The EX-P600 uses a high-performance Canon lens. This lens features a high-performance 4X optical zoom with 10-stage aperture settings. Using the high-resolution offered by the 6 Megapixel CCD, it is possible to get the best out of the 16X (including 4X digital zoom) zoom lens. The lens has an automatic barrier for protection, and can be used in conjunction with the three commercially available Canon conversion lenses (x 0.7 / x 1.5 / close-up) to increase the camera's flexibility. In addition to a start-up time of approximately 2 seconds and approximately 0.01 second release time lag, the EX-P600 has a high-speed continuous shutter function to take 3 photos per second up to 6 photos in succession, moving the camera up a level in terms of speedy response. Photo playback is also possible at intervals of approximately 0.1 seconds, a very convenient feature when scrolling through a large volume of images. With one press of the shutter, variations of exposure, white balance and focus position can be set. The multi-bracketing feature allows for a variety of images with different color effects, etc. to be taken (3 or 5 photos). With a large 2.0-inch high-definition TFT LCD, all the necessary information about shooting and effects is displayed clearly. The 2.0-inch monitor is a high-definition TFT LCD (115,200 pixels). The monitor makes it possible to scroll through photos, and to view the camera’s various functions and other information. The camera's photographic information, such as shutter speed, aperture, and focusing can be displayed graphically on the monitor. These graphical displays make it easy to quickly adjust settings manually. There is also an RGB histogram for high-end users. By choosing from Best Shot's sample photos, it is easy to automatically adjust such things as exposure and white balance levels. There are 25 sample photos to choose from, including 'soft focus' and 'sports.' It is also possible to register up to 999 of your favourite settings in your own 'My Best Shot' folder, allowing you to use the same settings at any time. By pressing the proprietary "EX button", the levels for white balance, ISO sensitivity, metering, and AF area settings can be displayed and adjusted on a single screen. When shooting manually, changes to these settings can be done quickly and easily. In addition to the fixed auto focus and the 7-point multi auto focus, the EX-P600 has an auto focus area that can be moved freely to the left or right, up or down using the arrow keys. This area can be enlarged during playback to ensure correct focus. Other features are: Built-in flash memory (approx.9MB)/SD memory card/Multi Media card compliant, external flash equipment can be used with the Sync Terminal, PictBridge support, built-in horizontal / vertical position sensor for correct positioning of the images and video clip mode.